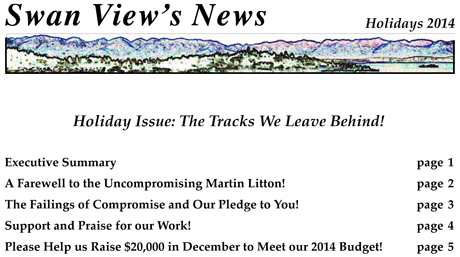 The Holidays 2014 issue of Swan View’s News celebrates the life of Martin Litton, our 30th anniversary, and asks you to support our uncompromising defense of America’s wild lands! Click here to view or download our Holidays 2014 newsletter. Please DONATE NOW to support our work and help us raise the $20,000 needed to meet our year-end budget!